Will you be celebrating Mardi Gras on Fat Tuesday next week? 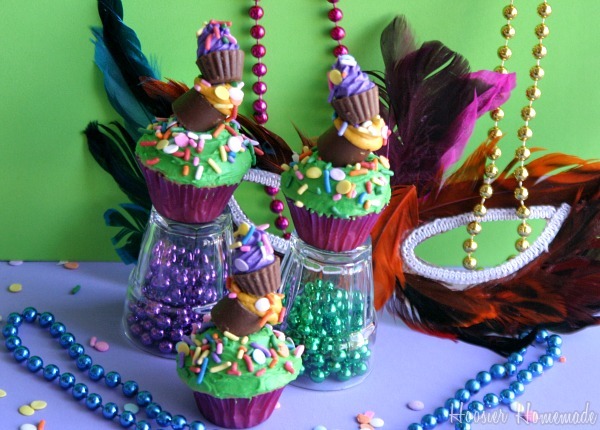 Even if you aren’t, it’s always fun to create some Mardi Gras Cupcakes! Right? 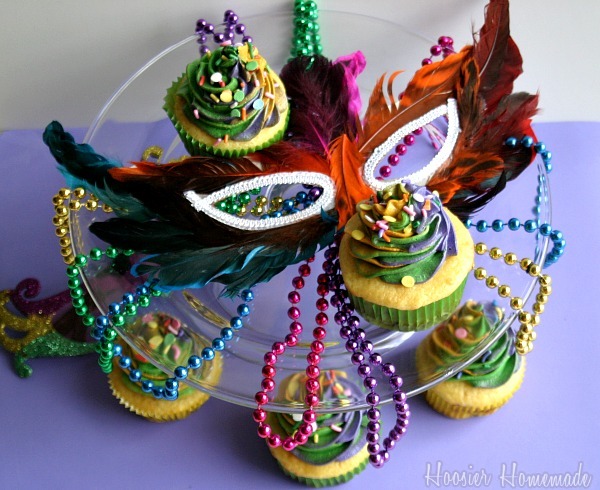 Last year, I shared King Cake Cupcakes and also Mardi Gras Cupcakes with printables. So this year, I wanted to change it up a bit, and was inspired when I saw Topsy Turvy Cupcakes over at Bakingdom. I think these would also be great for a birthday party! You could really change the color of frosting and share them for any celebration! 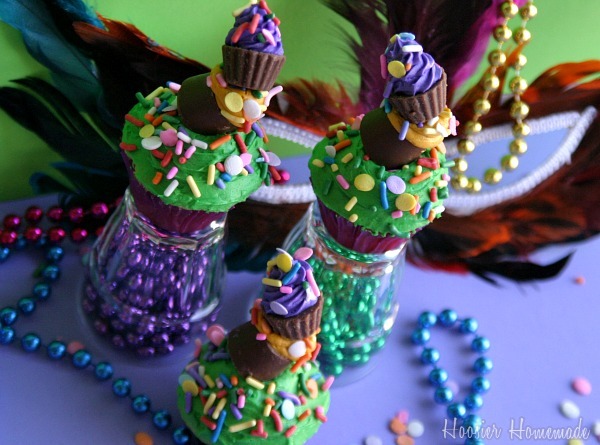 Topsy Turvy Cakes are often served at Mardi Gras Parties, with the different sized layers being placed crooked. I started with a mini cupcake and added Rolo and mini Peanut Butter Cup candies to the top. Keeping the colors traditional for Mardi Gras, I colored the frosting purple, green and yellow. And added colorful sprinkles in two different shapes and sizes. 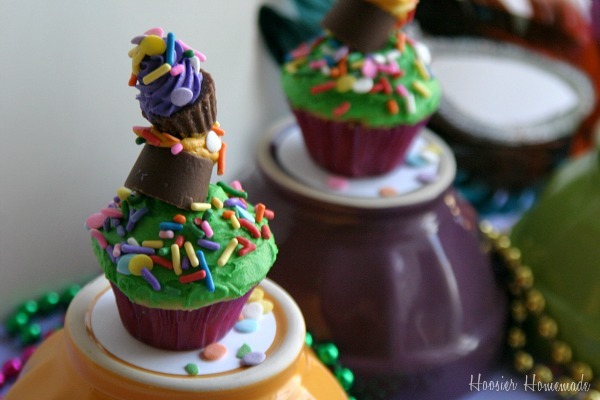 I also shared some yummy Mardi Gras Cupcakes using the King Cake Cupcakes recipe on Cupcake Chronicles Newsletter today. They have layers of cinnamon and sugar, and topped with Cinnamon Buttercream Frosting. 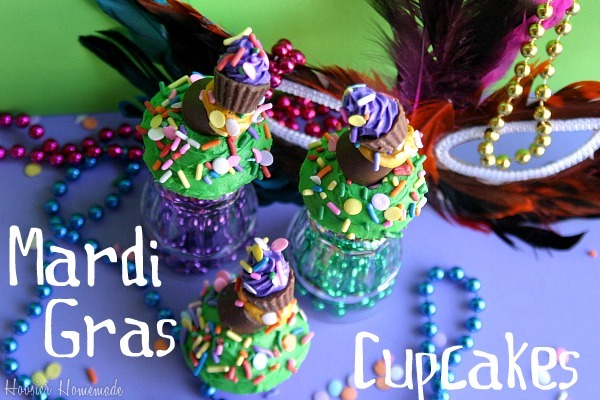 And in case you are in need of more Mardi Gras Recipes, we are sharing lots on Pocket Change Gourmet! 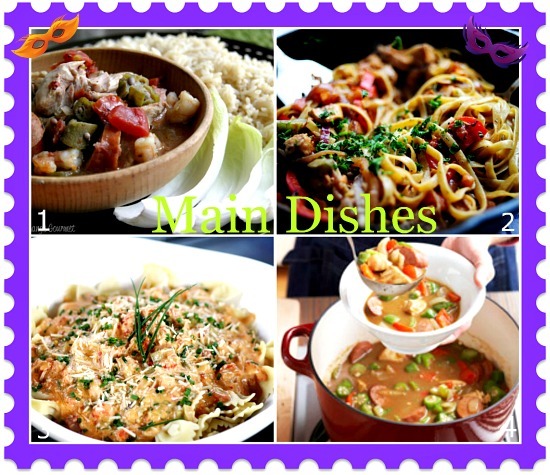 Including Main Dishes, Shrimp Dishes, Sandwiches, Sides and of course Dessert! Will you be cooking for Mardi Gras? Whatcha’ gonna cook? Head on over to Positively Splendid and enter to win my Cupcakes! 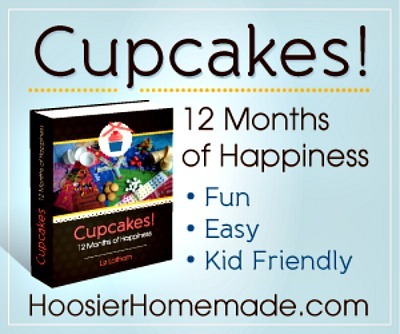 12 Months of Happiness eBook! I’ve done a topsy turvy cake, but I’ve never done cupcakes or seen them done. How creative. How fabulous. These are so awesome! I would LOVE for you to come link up this post as well as your other Mardi Gras post in my Carnival/Mardi Gras Link up! I”m getting a lot of hits on the linky and would love for you to join in! I”m giving pins on Pinterest to those linking up in my New Orleans Board. Come join the fun!